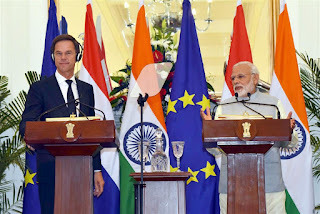 The Prime Minister of Netherlands Mark Rutte inaugurated the Indo-Dutch Ganga Forum in New Delhi. Last year in June, a Memorandum of Understanding (MoU) was signed between the Ministry of Water Resources, River Development and Ganga Rejuvenation, Government of India and the Ministry of Infrastructure & Environment of the Netherlands. This forum was inaugurated in lines of that MoU. Mark Rutte appreciated efforts being made under the Namami Gange programme launched by the Modi Government. He further mentioned that the local governments, the financial sector and the private sector, as well as communities, will need to join hands with the Indian and the Netherlands governments. The inauguration of the Indo-Dutch Ganga Forum was followed by a session during which issues like “Innovative Financing Models for Indo-Dutch PPP Projects” were discussed. The session included a detailed discussion on Hybrid Annuity based PPP mode.